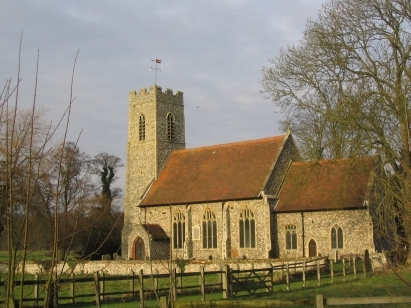 Lammas parish sits alongside the Bure river to the north-west of Coltishall and north of Norwich. The parish nowadays has very noisy neighbours - the Coltishall Air Base lies immediately east of the church. In the past this would have been a remote and tranquil rural area. In addition to the small village of Lammas the parish also encompasses the hamlet of Little Hautbois. 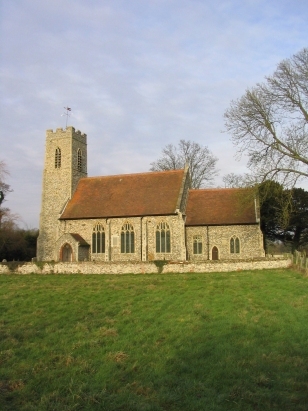 St Andrews church lies in an extremely attractive and peaceful setting hidden behind houses and alongside the Bure enclosed in a wide grazed pasture. The church was extensively renovated in the Victorian period but beneath this lies a 15th century church. Of interest the southern boundary of the churchyard is marked by a crinkle-crankle wall, a very pleasant feature. These records were transcribed from Microfiche 5 in the Norfolk Record Office collection. The filming was clear throughout and, although the early handwriting was a little ideosyncratic, for the most part it was quite legible. Given these constraints it is to be hoped that there are few transcription errors within this transcript.